Vast numbers of pioneers trekked their way to the Pacific Northwest in the mid-1800s, following a path known as the Oregon Trail. The pioneer whose name is most associated with the Oregon Trail was a man named Ezra Manning Meeker (1820-1928), who first walked and rode the trail in 1852 and later, when he was old, traversed the country to build popular support for his desire to have the nation officially memorialize the Oregon Trail. 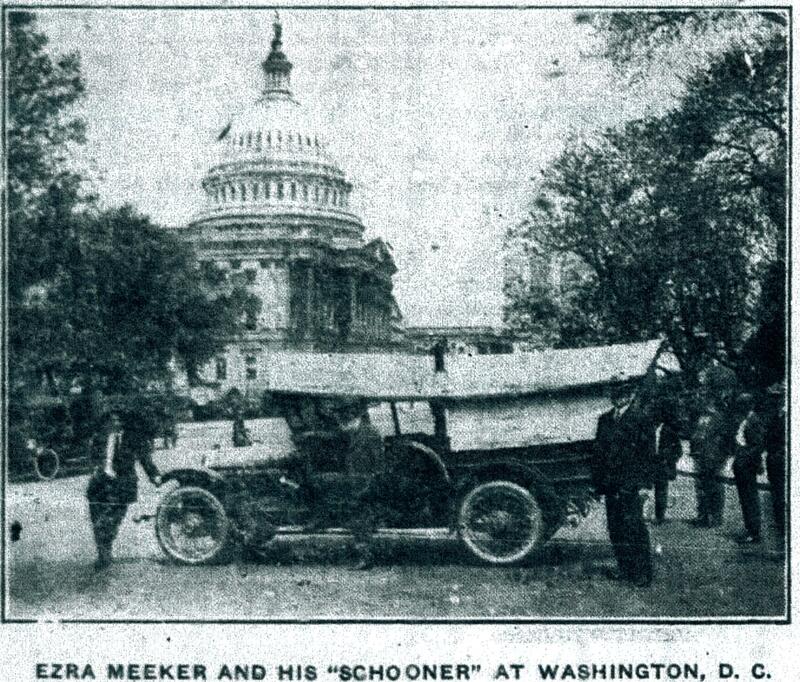 This photograph, reproduced from a microfilm image of the July 3, 1916, edition of the Pekin Daily Times, shows the Pathfinder “Schooner” that Oregon Trail pioneer Ezra Meeker drove on his 1916 tour of the country promoting a proposed national highway called Pioneer Way. Meeker arrived in Pekin during his tour on July 3. As a leading settler of the Northwest, in 1877 Meeker platted the town of Puyallup, Washington, which was incorporated in 1890. Meeker was elected the town’s first mayor, and his Puyallup residence, the Meeker Mansion, is on the National Register of Historic Places. In those decades, Meeker was active in attracting settlement and promoting development of the Pacific Northwest. Meeker was 76 years old when he decided to try to retrace the old Oregon Trail from Oregon back to Missouri in 1906, taking a wagon and a team of oxen to find the route he’d first taken in 1852. Along the way, he placed stone markers to ensure that the route would be remembered by future generations. This grand trek began Jan. 29, 1906, and concluded June 6, 1908. One of his stops along the way, just as on his 1916 trip, was Pekin, which he visited on Nov. 23-24, 1906, according to Kent Mohr, a descendant of the Meeker family. Mohr says Meeker didn’t come to Pekin only to promote the Oregon Trail and Pioneer Way, but also took the opportunity to call on his cousins, the Samuel Meeker family. Samuel was one of the sons of Moses Robinson Dewey Meeker (1822-1891), who with his brother Daniel Baldwin Meeker (1819-1904) were among the pioneer settlers of Tazewell County. Moses and Daniel were sons of Benjamin Meeker (1793-1857), who was born in Essex County, New Jersey, and died in Delavan, Illinois. Benjamin and his son Daniel are buried in Prairie Rest Cemetery, Delavan, while Moses is buried in Green Valley Cemetery. Benjamin’s older brother Manning Meeker (1785-1820), was the grandfather of Ezra Meeker. This lithograph from the 1873 Atlas Map of Tazewell County shows the stock farm of Moses R. D. Meeker in Sand Prairie Township. Ezra Meeker of Oregon Trail fame was a first cousin once removed of Moses Meeker. The 1873 Atlas Map of Tazewell County shows Daniel B. Meeker’s homestead in Delavan Township, a few miles east-northeast of Delavan, while the homestead and stock farm of Moses R. D. Meeker is shown in Section 30 of Sand Prairie Township, several miles west of Green Valley. The 1873 Atlas Map also includes a short biography of Moses R. D. Meeker on page 82 as well as a lithograph drawing of his residence on page 133. Moses’ 1873 biography, which mistakenly gives his middle initial as “B.” (elsewhere correctly showing “R.”), describes Moses as “one of the heavy farmers and successful stock raisers of Tazewell county” – but in this case “heavy” refers to the output of his farm, not the weight of his body. 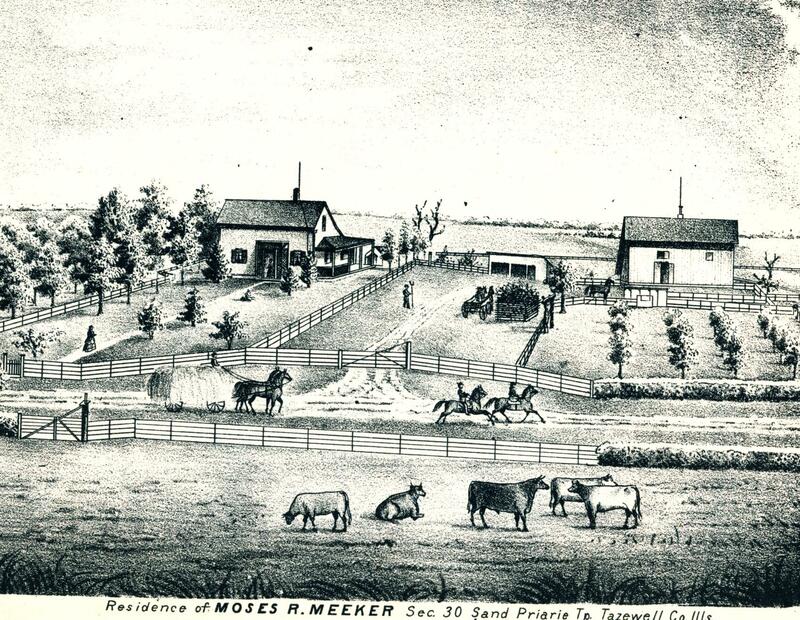 Moses first came to Tazewell County around 1846, settling near Tremont for six years before acquiring his stock farm in Sand Prairie Township. The 1880 U.S. Census lists Moses and his family as residents of Pekin, where his son Samuel was still living in 1916 when their cousin Ezra stopped for a few days to promote Pioneer Way.